Garlic chives are an edible that are definitely more garlic than chives. They look similar to ordinary chives at first glance too. But look more closely and the leaf texture is solid, flat, and rather chewy, quite different from the soft, rolled, hollow leaves of chives. Their misleading common name has led Western cooks to use garlic chives raw, with unfortunate results, and they’ve never taken off as an edible. It seems they need to take lessons from the cooks of south-east Asia who know the best thing to do is to add some heat. 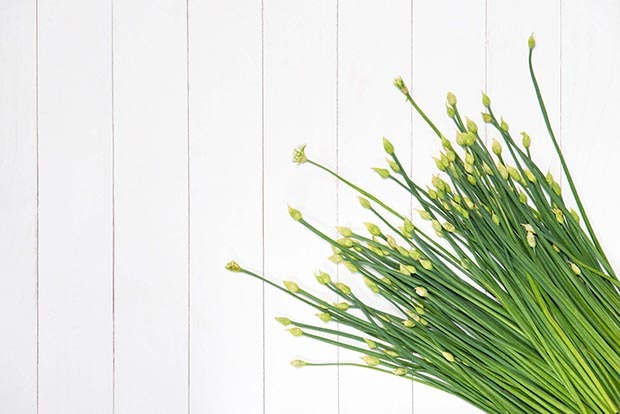 Cooking methods are diverse, but generally garlic chives (or Chinese chives as they are called overseas) will be lightly cooked, both flowers and leaves. If overcooked they lose their subtle flavour. They can also be blanched, stir-fried, or incorporated as part of a clear soup, in the same way you would use onion or garlic. Varieties have been developed for improved leaf, tender flower stems, and with broad leaves for growing in the dark. The last kind are sold in bundles of pale, very tender leaves and are sought after to accompany fried noodles. 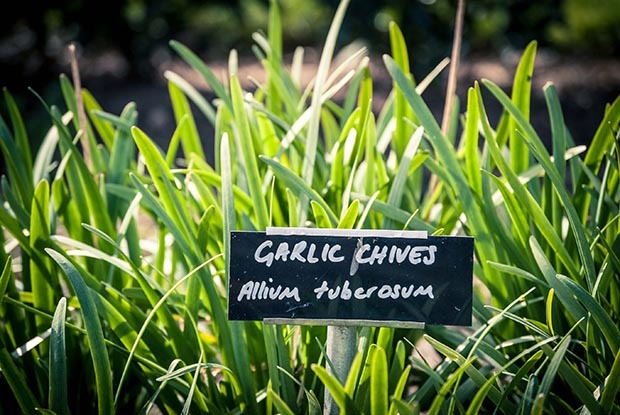 When grown rapidly in ideal conditions, garlic chives have a mildly garlic with a hint of onion, pleasant, flavour. The flowers or florets have a sweet, mild, almost rose-like scent and a pleasant taste. Once you taste them at their best, you will want more than one plant. 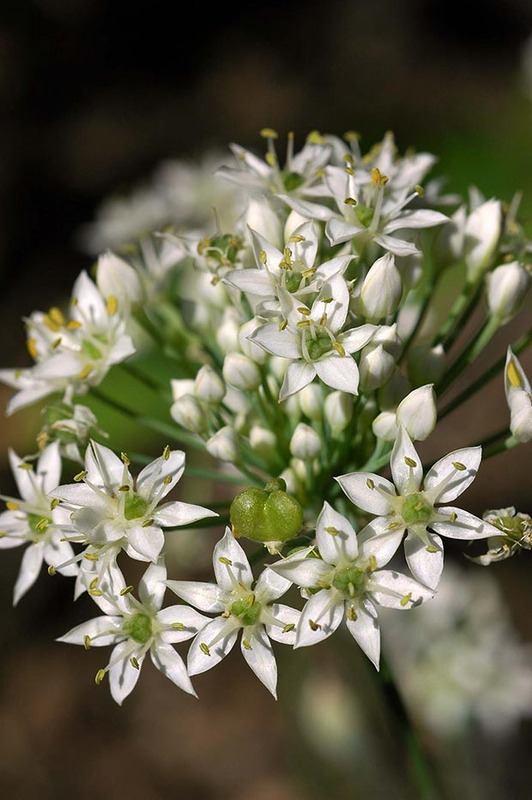 Garlic chives have been used as a crude ‘drug’ since 770BC. The part used is the seed, called kyushi, kyusaichi or kyusaijin. Traditional uses were to help with lack of energy, urinary incontinence, kidney and bladder weakness, lower back pain, swelling, pain in the knees, as a tonic, and as an anti-aging supplement. They are rich in carotene, vitamins B, C and E, and sulphuric compounds, including allyl sulphide (also found in onions and garlic) that contributes to their distinctive smell. Research shows allyl sulphide is a preventative in skin cancer, liver cancer and cancer of the large intestine. 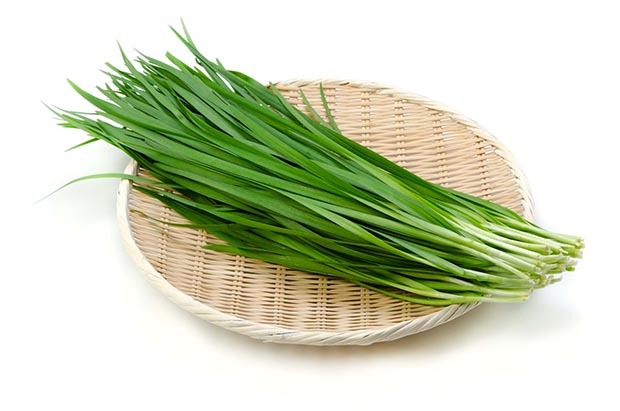 Research on garlic chives seed extract shows promise as an energy enhancer, immune booster, and for maintaining healthy neurotransmitters after stress. There is another reason to grow garlic chives. The flowers are star-shaped and creamy-white, held in heads or umbels on long, straight, 60cm-high stems. They appear in late summer-early autumn when other flowers are waning, and last for ages. Even if they are not used in cooking, plants are worth including on the edges of the herb garden or vegetable plot for their ornamental value. Bees and butterflies love them and they are a useful late season nectar source for beneficial insects. These little blooms are delightful in flower arrangements and can also be dried for floral displays. Allium tuberosum does best in light, fertile soil with plenty of organic matter, but will grow readily in most soils. Full sun is preferred, although they will grow in light shade. They are tougher than chives (Allium schoenoprasum), surviving through the heaviest frosts. They are also taller, and have tuberous roots rather than bulblets like chives. These long roots do best in built-up beds with good drainage and soil depth. However, you need a little more patience as garlic chives are slower growing than ordinary chives, and it doesn’t pay to hurry them along. I have grown them from seed, but they can be unreliable if the seed is not fresh, and they take forever to get to size. Four or five-year old clumps can be divided and this is the quickest way to propagate them. Whether you go for seed or division-grown, plants need to establish before your start picking. Flower stems on young plants should be removed, allowing plants to build up strength. This also avoids self-seeding, reported to be a problem (although personally I have found chives to be the more prolific). Once planted, it’s easy to forget about garlic chives in the garden. Like garlic, they don’t compete well and soon get smothered in weeds without regular weeding. They are best kept mulched if you don’t want to lose them. Plants will survive considerable drought, but if stressed they become tougher in texture and stronger flavoured. For the best flavour, you want to keep the plants evenly moist. When watering, water thoroughly to encourage deep rooting. 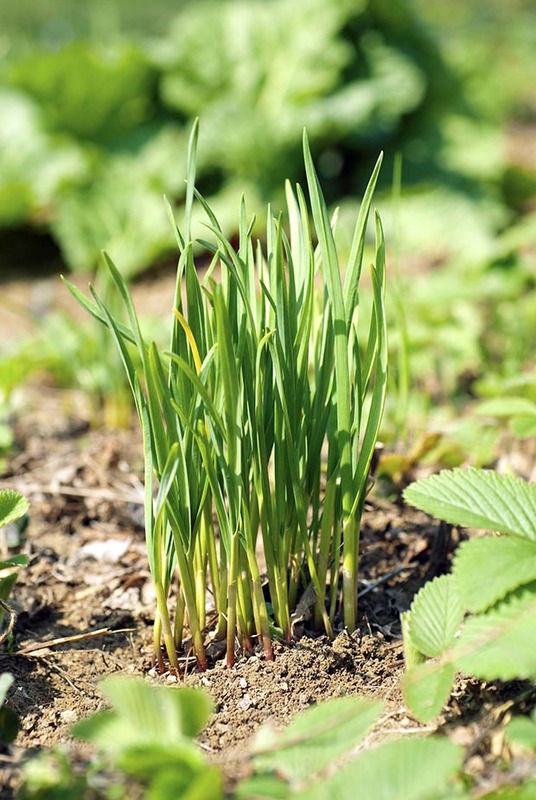 If you are serious about using garlic chives, it is better to grow several plants due to their lower production. What I’ve found is once you catch the flavour, you will want more than one plant. 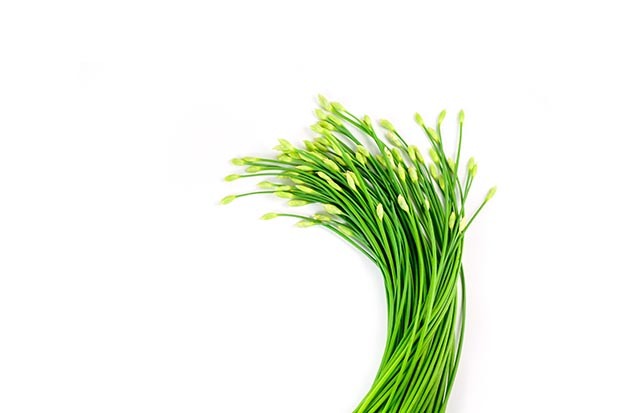 Choose fresh, crisp chives that are not wilted. They deteriorate quickly, but can be stored in the fridge for 1-2 days. Store wrapped in damp newspaper or wet paper towels in a plastic bag in the vege crisper. 1. Dig up an established (4+ years old) clump in spring or autumn. 2. Separate into smaller clumps of about three rhizomes. 3. Replant in fresh soil with organic matter added. 4. Discard older roots at the centre of the clump. As a slower growing plant, garlic chives suit containers and look great in terracotta planters. • Choose a deep pot for their long roots (at least 20cm). • Plant in a free-draining, proprietary potting mix (not soil). • Keep moist – do not allow to dry out. • Liquid feed every 5-6 weeks after harvesting. • Pots of chives can be brought indoors and grown as a houseplant. • Only harvest from established clumps. 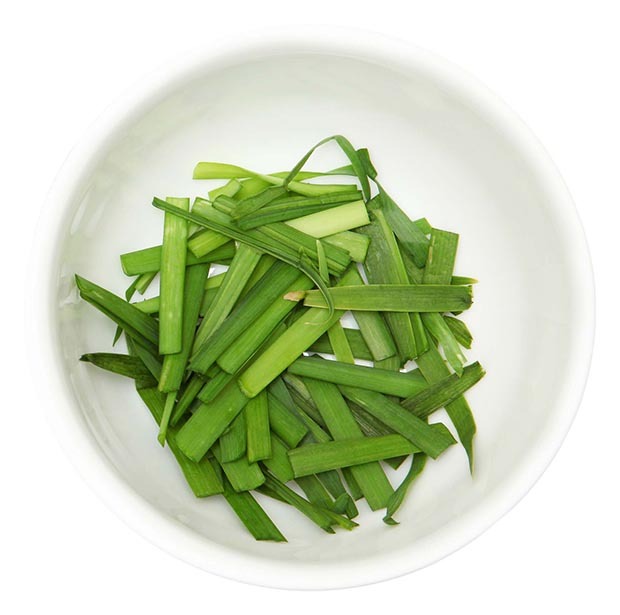 • Cut back several times, beginning late spring and through summer, or snip individual leaves. • When cutting, cut to the base of the leaves, just above soil level, as the lowest part of leaves are most tender and this promotes new, vigorous growth. • Flower stems can be picked with tight buds for stir-fries. • Use the leaves in a similar way to scallions or garlic, slicing into 2-3cm lengths, then briefly stir-fry with a dash of chilli. • For a garnish, cut into 1-2cm slices and either stir-fry in a little oil, or blanch enough to soften without loss of colour. • Add to scrambled eggs and top with smoked salmon, chopped garlic chives and a touch of sour cream. • Delicious in Chinese-style dumplings with egg, shrimp and pork, or in any minced meat or seafood filling. • Drop 2-3cm lengths into clear soups and simmer briefly – they’re often included in miso soup. • Stir-fry with curried vegetables and potatoes. • Add to herbal vinegars, or incorporate into soft cheeses.